Crude Oil is a naturally occurring flammable liquid consisting of a complex mixture of hydrocarbons of various molecular weights and other liquid organic compounds that are found in geologic formations beneath the Earth's surface. Petroleum is the name used to cover both naturally occurring unprocessed crude oils and petroleum products that are made up of refined crude oil. Crude oil is a fossil fuel that is formed when large quantities of dead organisms, usually zooplankton and algae, are buried underneath sedimentary rock and undergo intense heat and pressure. Crude oil is recovered mostly through oil drilling. This comes after the studies of structural geology (at the reservoir scale), sedimentary basin analysis, and reservoir characterization (mainly in terms of porosity and permeable structures). It is refined and separated, most easily by boiling point, into a large number of consumer products, from gasoline (petrol) and kerosene to asphalt and chemical reagents used to make plastics and pharmaceuticals. Crude oil is used in manufacturing a wide variety of materials, and it is estimated that the world consumes about 90 million barrels each day. Crude oil varies greatly in appearance depending on its composition. It is usually black or dark brown (although it may be yellowish, reddish, or even greenish). In the reservoir it is usually found in association with natural gas, which being lighter forms a gas cap over the petroleum, and saline water which, being heavier than most forms of crude oil, generally sinks beneath it. Crude oil may also be found in semi-solid form mixed with sand and water, as in the Athabasca oil sands in Canada, where it is usually referred to as crude bitumen. In Canada, bitumen is considered a sticky, black, tar-like form of crude oil which is so thick and heavy that it must be heated or diluted before it will flow. Venezuela also has large amounts of oil in the Orinoco oil sands, although the hydrocarbons trapped in them are more fluid than in Canada and are usually called extra heavy oil. These oil sands resources are called unconventional oil to distinguish them from oil which can be extracted using traditional oil well methods. Between them, Canada and Venezuela contain an estimated 3.6 trillion barrels (570×109 m3) of bitumen and extra-heavy oil, about twice the volume of the world's reserves of conventional oil. 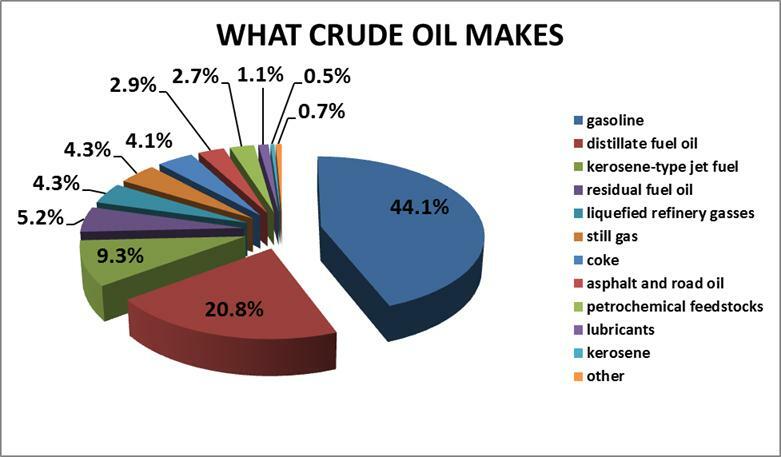 Crude Oil is used mostly, by volume, for producing fuel oil and petrol, both important "primary energy" sources. 84 percent by volume of the hydrocarbons present in crude oil is converted into energy-rich fuels (petroleum-based fuels), including petrol, diesel, jet, heating, other fuel oils, and liquefied petroleum gas. The lighter grades of crude oil produce the best yields of these products, but as the world's reserves of light and medium oil are depleted, oil refineries are increasingly having to process heavy oil and bitumen, and use more complex and expensive methods to produce the products required. Because heavier crude oils have too much carbon and not enough hydrogen, refining processes generally involve removing carbon from or adding hydrogen to the molecules, and using fluid catalytic cracking to convert the longer, more complex molecules in the oil to the shorter, simpler ones in the fuels. Due to its high energy density, easy transportability and relative abundance, crude oil has become the world's most important source of energy since the mid-1950s. It is also the raw material for many chemical products, including pharmaceuticals, solvents, fertilizers, pesticides, and plastics; the 16 percent not used for energy production is converted into these other materials. Crude oil is found in porous rock formations in the upper strata of some areas of the Earth's crust. There is also crude oil in oil sands (tar sands). Known oil reserves are typically estimated at around 190 km3 [1.2 trillion (short scale) barrels] without oil sands, or 595 km3 (3.74 trillion barrels) with oil sands. Consumption is currently around 84 million barrels (13.4×106 m3) perday, or 4.9 km3 per year. Which in turn yields a remaining oil supply of only about 120 years, if current demand remains static.